I Love You S'more. | Life. Realized. 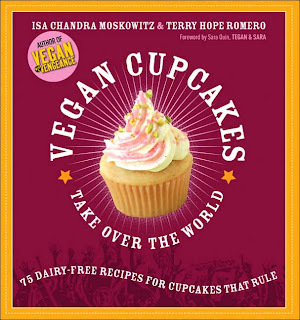 As I mentioned before, I have a long list of recipes that I want to try from the Vegan Cupcakes Take Over the World cookbook, so I have been baking a different treat every week and bringing it in on a random day to surprise the teachers at my son's school. They are my heroes. Some days I want to put him in a dinghy full of Gatorade and beef jerky and push him out to sea. And I don't have the job of trying to teach him how to solve for x. Although I have...and I'm really good at it. Don't be jealous. Anywho, this week's treat was their S'mores Cupcakes with Fluffy Vegan Buttercream Frosting; which I am generously going to share with you. This cookbook is awesome (even for us omnivores), so buy it! They say money can't buy you happiness, but this $10 cookbook sure comes close. I promise the authors are not paying me (but hey, I'm not one to turn down a five spot). I've genuinely had SO much fun experimenting with these recipes! No butter in the buttercream and I like it better than the real thing? How is that possible?! They're like magicians! Line a muffin pan with cupcake papers. I'm not sure if you can tell from the pictures, but I didn't have enough of a single style of cupcake papers to do all of them (hey, I've been baking a lot lately), so I have Valentine's Day, flowered, and Halloween papers, and one without a paper at all (we used that one as the tester). It may cause holiday confusion. I hope they'll get through it okay. Mix the brown sugar, oil, molasses, yogurt, soy milk, and vanilla in a large bowl. With a spoon. How easy is that? Sift the flour, baking powder, baking soda, cinnamon and salt in a separate bowl and mix. Add the graham cracker crumbs and mix again. Add the dry ingredients to the wet mixture in 3 batches, mixing well after each addition. Fill cupcake liners full. Bake for 22-25 minutes or until a toothpick inserted in the center of one comes out clean (I set the timer for 18 minutes then checked again at the 20 minute mark...they were ready). Transfer to a cooling rack and let cool completely before decorating. Before I move on to decorating, I must admit that I panicked a little when these first came out. They were not cake-like at all (more warm banana bread-ish), and I thought I had screwed up somehow. Then I realized (after reading their intro) that the point is for them to be a more gooey, s'more-like texture. I was assured by my husband and son that they were delicious, so I stepped back from the cliff's edge. I waited until this morning to frost and decorate them, and by then they were just a denser, richer cupcake. And tasty. Beat the shortening and margarine together until well combined and fluffy. Add the sugar and beat for 3 more minutes. Add the vanilla and soy milk, beat for 5-7 additional minutes until fluffy (and boy, is it!). This refrigerates really well and stays good for a looong time. I doubled it once thinking it only made enough for 12 cupcakes and I had more. Big mistake. I had frosting up the ying yang. I popped it in the fridge and used it again the next week. I just let it return to room temp before piping it. Like a good boyfriend, it is super low maintenance. I like that in a man...and frosting. So easy, right? I simply piped the frosting onto the cupcakes using a large star tip. I have also just slathered it on with a butter knife in the past and that looks good, too. I sprinkled the remaining graham cracker crumbs and shaved some chocolate over the top before finishing them off with a graham cracker square. Aren't these mini graham crackers cute? I wanted to pinch their little cheeks. Don't let my wordiness fool you. These were so quick and easy to make. One thought I had, if I wanted to get away from the gooey-ness and instead have a more fluffy cake-like texture, is to use the traditional chocolate cupcake recipe and still add in the graham cracker crumbs. Let me know if you've made these and what you think. I will say that my absolute favorite so far has been the Coconut Lime Cupcakes with Lime Buttercream. They looked and tasted amazing...complete with a little lime wedge on top. The Cookies 'n Cream are also divine. Unfortunately, I made those two before I was a blogger (you know, in my past, less fulfilling life); so I don't have pictures to share. Next time. Vegan or not, share your faves! I love new recipes! Beautiful cupcakes! I especially love all of the little decorations at the end. Thanks so much for sharing with Hearth and Soul!! Thanks, Elsa! They were really fun to make. I've been meaning to try them with a basic chocolate cupcake. This cookbook is the best. Love your blog!